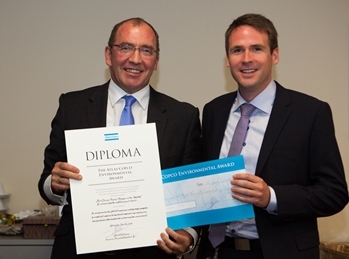 Atlas Copco’s Environmental Award for 2012 goes to the team that developed the new, groundbreaking GA VSD+ compressor. The innovative compressor can cut energy consumption by roughly half compared to traditional compressors, setting a new industry standard in energy efficiency. Bert Derom, Product Manager in Belgium and his project team at the Industrial Air division in Compressor Technique in Antwerp won the award which includes EUR 5800 for use toward an environmental initiative or project. The greatest innovation with the GA VSD+ is the integration of the interior oil-cooled permanent magnet motor with the compressor element, creating a smaller, lighter, quieter and more efficient machine. The new compressor gained immediate acceptance by the market, selling more than 500 units in the two weeks following the launch in April. (left to right) Gert Follens, President Industrial Air Division and Bert Derom, Product manager presenting the team award. Atlas Copco’s Compressor Technique business area provides industrial compressors, gas and process compressors and expanders, air and gas treatment equipment and air management systems. It has a global service network and offers specialty rental services. Compressor Technique innovates for sustainable productivity in the manufacturing, oil and gas, and process industries. Principal product development and manufacturing units are located in Belgium, Germany, the United States, China and India. Atlas Copco is an industrial group with world-leading positions in compressors, expanders and air treatment systems, construction and mining equipment, power tools and assembly systems. With innovative products and services, Atlas Copco delivers solutions for sustainable productivity. The company was founded in 1873, is based in Stockholm, Sweden, and has a global reach spanning more than 170 countries. 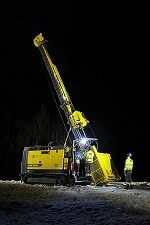 In 2012, Atlas Copco had 39 800 employees and revenues of BSEK 90.5 (BEUR 10.5).